Robin has been involved in the Real Estate industry since 1996. Fifteen years ago, she became an Associated Staging Professional (ASP) and is also presently a member of the International Association of Staging Professionals (IASP). In 2016 she started her own staging company and has been busy since day one. Word has gotten out that she is not your typical "cookie cutter" Stager and that each home she completes is uniquely beautiful. From her experience as a Realtor, she understands what buyers are looking for in a home and is knowledgeable in local Real Estate markets and trends. Her love of interior design is evident in the spaces she creates. Her portfolio includes residential homes (including high rises on the Gulf, single family homes and villas), renovations and new construction. One of the major builders in the Naples area has used her services to furnish two inventory/model homes. From her own inventory she provides everything needed to wow the buyer including furniture, artwork and accessories. Her goal is to showcase your home in its best light on the web and when potential buyers visit so it will sell quickly and for top dollar! Carrie Brigham Design offers unparalleled presentation techniques that elevate the interior design process and redefines the standard for the ultimate luxury design experience. Welcome to Exit STAGE Left, your source for home staging, move management, consignment and charitable donation assistance. We will help you plan your EXIT, STAGE your home for quick sale or rental. Naples Home Stylist is a professional design/decorating and home staging business located in Naples, Florida. As a home stager, I work directly with realtors and clients to give homes a beautiful, lived-in appearance during the selling process. My business offers a quick turnaround time for staging and offers monthly rental options for furnishings and decor. Naples Home Stylist's services include decorating, remodeling, home staging, painting and home organization. I also design shelving, custom closets, and small pieces of furniture. On the design and decorating side, I enjoy creating a beautiful, comfortable and efficient living space for my clients' exact needs and budget. I pride myself on being "the affordable decorator for everyday living." I have been decorating as a hobby for over 15 years. I studied Interior Design at the New York School of Interior Design's MFA program from 2010-2011 before leaving New York City for Naples, FL. My husband is my carpenter, handyman and partner. Together, we are looking forward to expanding our business in beautiful Naples. Downsizing? Did you inherit a home and don't intend to keep it? We help you plan your EXIT, STAGE your home for quick sale or rental, and deal with what's LEFT when you are ready to go! Move on, without the drama. Licensed real estate agent and certified home stager specializing in downsizing and professional real estate services. We are Southwest Florida's premier home staging company. We specialize in staging both vacant and furnished homes so they sell faster and for more money. We have the largest inventory of upscale furniture available for staging in the Southwest Florida. Contact me today to find out all the great benefits Home Staging can offer you. Do it right the first time. Staging works!!! - Studies have shown that buyers spend an average of 6 to 9 minutes in an empty home and 40 minutes in a staged home. The reason for this is that a staged home excites the buyers' imagination. A warm, inviting atmosphere causes buyers to start picturing themselves living in the home: preparing meals, relaxing, and entertaining friends in their new home. Staging allows them to "mentally move into" the home. This is necessary for a buyer to want to make an offer. Most buyers just do not have the ability to envision an empty home and it becomes overwhelming. With so much competition on the market, buyers find it difficult to remember them all. Furnished homes are more memorable. Vacant homes can also look dark, unwelcoming, and dirty. Nicely staged homes bring more offers closer to asking price or over. The buyer also feels the home was well taken care of. Interior Styling has been a passion all my life. I love to work with clients to create beauty and charm to their space. I enjoy seeing how happy it makes them. Knowing that I helped create the "sale"........ or the "Redesign" project where the home is transformed into an organized living space with beauty and function (a great reflection of the owner), is deeply satisfying. Maze Home Staging is a HSR Certified Professional home staging and interior redesign organization serving Bonita Springs and surrounding area. We have completed the most comprehensive and intensive home staging and redesign certification course in North America, provided by Home Staging Resource. The HSR Certification program was the first and is one of the only Accredited staging training by the Real Estate Staging Assocation (RESA) who is the governing body for the home staging industry. Home Staging vacant and occupied homes and re design service. We Transform homes from the Ordinary to a Wow factor Extraordinary. Judy Welker is the owner, she is a high aesthetic with an eye for design. We can assist with color, organization, remodeling, lifestyle living. Home Staging, Decorating and Shopping. ReDesigned Interiors of SWFL, Inc.
Home staging is the process of preparing your home for sale. ReDesigned Interiors of SWFL, Inc. is a local company serving homeowners and real estate agents who would like their listings to sell quicker and without price drops. Call us to set up a consultation today! What does a Lely Resort home stager do? Home staging companies in Lely Resort, FL employ a variety of different techniques to present the home in the best light possible. The first step will likely be to make sure the home is impeccably clean, including the exterior of the house. Next the home stager will work on removing the personal touches that are unique to the current owners. Paint colors might go from dramatic reds and purples to neutral tones like beige and taupe, in order to appeal to the masses. The home will likely be cleared of family photos, risqué artwork, collections and knickknacks, so potential buyers will be able to better envision their own life in the house. In some cases furniture will be swapped out, and you might not even recognize your own house. Some Lely Resort home stagers tackle most of these tasks themselves, while others work with subcontractors and other professionals to get the job done. Here are some related professionals and vendors to complement the work of home stagers: Interior Designers & Decorators, Photographers, Real Estate Agents. The process of staging a home can be difficult for some homeowners, especially when being asked to change things you’ve poured your heart and soul into over the years; but try not to take anything personally, as the stager only has your best interest in mind and no intention of insulting your personal taste. Before you contact a professional home staging company in Lely Resort, FL, make sure to consider a few things: Are you willing to change your home and take the advice of this professional to help sell your house? Do you think your house would greatly benefit from the help of a stager? How long are you comfortable having your home on the market? A staged home is likely to sell faster and, on occasion, at a higher asking price than a non-staged home. While there is no guarantee this will always be the case, it’s often true and can make the entire selling and moving process a lot less stressful in the long run. If you are selling through a real estate agent, it’s a good idea to get their opinion on whether staging your home would be beneficial to your specific situation. 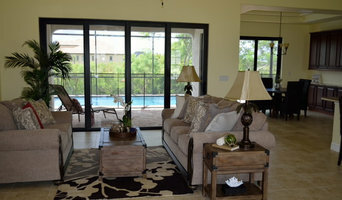 Find a certified Lely Resort home stager on Houzz. Narrow your search in the Professionals section of the website to Lely Resort, FL home stagers. You can also look through Lely Resort, FL photos by style to find a room you like, then contact the professional who staged it.